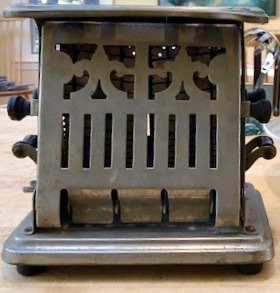 This simple, flip-side, manual toaster, patented in 1914, offered warm toast every morning of my childhood before and after World War II. By nature of its two-sided panel design, Mom could grasp a black button, flip the panel down, insert a piece of bread on one or both sides, and plug the toaster in. It toasted one side at a time, necessitating patience and hovering to get the bread brown, but not too crisp, then manually turning it over to face the red coil for even crispness. In contrast, I own a Breville, ten-setting, multi functional toaster oven where I press a button , choose # 6 degree of crispness and turn away to hand drip my coffee as the machine performs perfection morning after morning. With gratitude, I marvel at the memory of my mother standing at the entry handing me a piece of hot buttered toast. Ever-patient, holding up her offering, Mom said, “Take it easy, Faye,” as I dashed out the front door to meet up with best friend Harriet’s Dad, motor running at the corner curb, waiting to drop us off at junior high on her dad’s way to work. Recently, a young friend recently noticed the antique toaster on display on a kitchen shelf. Years ago, when my two siblings and I cleared out our parent’s belongings, I chose the Universal toaster as a reminder of my childhood. She was fascinated by the fact that the plug had to be manually inserted and removed at every usage. In my memory, the toast I savored as I ran down the block was warm, oozing with fresh butter and perfect in its crispness. To achieve this, Mom would have stood close by the toaster, ready to grasp the tiny black button to flip the bread at just the right degree of browning, only to begin all over again. Mother was quiet and even-tempered by nature. I was not. Slow and dreamy upon awakening, I was eternally late though I tried my hardest. I cannot recall how many times Mom must have called up the stairs to prompt me to move along; but by the time I was at the front door, I was wound up, ajitated and ready to skip breakfast. Most of all, I dreaded the possibility of disapproval and a raised eyebrow. I am still slow to rise, and at this writing, grateful to appreciate the memory of a simple gesture, which made a difference in how I faced my day. As an adult, my breakfast rituals are specific and predictable. I grind fresh coffee beans, boil water, and drip coffee with a steady pouring hand. I choose and toast an Ezekial high protein, sprouted wheat bun for sustained energy, and slather it with nut butter. Sometimes, I add micro-greens or asparagus. In this post mid-election Trumpian era where breaking news abounds at every moment, I am grateful for morning dreaming and the simple pleasures of a calming and nutritious breakfast before revving up to face whatever the day brings. This entry was posted in Creativity, Currents, Happiness, Mindfulness, Relationship(s), Sustainability, Well-Being, Writing and tagged morning dreaming, quiet, simple gestures, simplicity benefits on November 19, 2018 by fayewriter.